Welcome MGB readership to another Engine review of RCMK's ( Radio Control Marine Korea ) newest Rear Exhaust offering. You should, by now, be well aware that the engineers at RCMK are always focused forward in engineering products we RC boaters worldwide would love to have. If your desires have been for a "Pull starter equipped", rear exhaust engine that fits where a side exhaust engine you now own resides, or you simply want a newer sleaker boat designed around it...look no further! What we have here is such an engine. 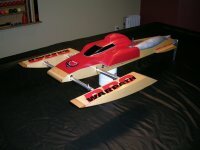 The RCMK "RZ-254 EVO". Based on the now refined and improved S-254 EVO, the "RZ" is that same engine with the cylinder and coil rotated 90 degrees placing the exhaust out over the PTO end of the engine and the carburetor above the starter. Most of the specifications of the RZ254 EVO are the same as those of the S254 EVO. You can refer to our S254 EVO engine review here. ** Within the North American market, all RZ series engines are being sold with the mounts shown. Gizmomotors engineered the mounts and has them custom made specific for RZ applications. The magneto-side mount is RZ use specific while the PTO end fits all RCMK & Zenoahs. *See the MGB review of Gizmomotors "Life Time Mounts" for more information (coming soon). Rubber isolators spacing, "center-to-center" is 5 7/8" - 6". Stringer/rail spacing is 5". A special "Drop" PTO end mount is avalible as well from Gizmomotors. * It will increase the center line spacing by approximately 9/16 -5/8". Engine view showing how compactand narrow the upper engine is. Cowl coverage requirements on low profile type hulls will be a lot less with no carburetor or exhaust parts on the sides. Side view showing again the compact nature of the RZ layout. The secondary coil is now mounted on tabs on the side of the case right next to the sourse coil. Wires can be wraped up and tucked away in the gap between them. Viewed from this side, not much going on. The only thing will be a throttle linkage of the user's choice, nothing provided with the engine at this time for carburetor shaft rotation. Applications using the RZ series will have many advantages in such a design. Right off the bat is going to be the fantastic pricing of this engine. At around $339.00 delivered domestic (USA), the RZ falls in at near half the cost of other rear exhaust engines on the market. While the RZ is not an exotic billet engine as other RE versions are, it is built with the integrity of one. Based on its side-exhaust brother the "S-254 EVO" that has already proven itself on dyno tests exceding 5 HP and a tad over 2 foot-pounds of torque, the RZ should, for a production cast-block integral head rear-exhaust engine, have the most power "out of the box" one can currently purchase. Another plus is the narrow engine width which will allow placement in the sponson areas of large scale cats. Hydros and riggers can use sleaker cowling designs with less frontal area offering greater aerodynamics. One thing that must be taken into consideration with the rear-exhaust engines if retrofitting it in a boat which currently has a side-exhaust engine, is the fact that all of the pipe is behind the engine. This in turn makes for a slightly longer engine-pipe combination (approximately 2 - 2.5" depending on setup). In some cases, especially when using heavy tuned pipes, this can pull the CG (center of gravity) a little bit towards the back of the boat. This can easilly be compensated with a little bit of weight up front or moving the engine slightly forward. In new installations this should pose no problems at all...proceed with setting your boat's CG as you wood with any engine/pipe combination. Ignition layout is typical enough, though as stated all items are rotated 90 degrees. The coil and starter dog are all the same as an "S" version. The flywheel also, though the keyway is cut 90 degrees for this RZ application. The intake manifold is a "S" version part as well. The fit is tight without a doubt, all the parts just clear each other which helps keep it all quite compact. With the manifold removed the machining of the intake portion of the actual cylinder becomes evident. RCMK has cut a steep angle, allowing the manifold and the carburetor to tilt upwards so it clears starter assembly. At this time the only header system is RCMK's own that uses a sandwiched "O-Ring" flange and an aluminum head pipe of approximately 0.860" O.D. It works well with O-ring type pipe couplings (typically found on aluminum pipes) but is under the 7/8" - .875" required for most slip joint and clamped steep pipes. * Gizmomotors should have a stainless steel 7/8" header that can use the current "No Leak" type manifolds by the time this article go's live...great news ! With the flywheel removed we get a better view of just how beefy the RZ cases are cast! thick and solid as it looks. No whimpy castings here! making these cases really solid and well thought out. Cylinder removed showing what we all know now as the "EVO" cylinder casting. between "RZ" and "S" engine cylinders. A better shot of the intake manifold area. Notice a small bit of machining done on the roof of port. This aligns the manifold's roof. intake tract, the flowpath is now straighter within it. Unfortunately I am unable to provide an "On-water" performance report on how the RZ runs at this time. This reviewer is currently building a new rigger specific to the RZ's design attributes and will be doing on-water testing in spring 2010. * Note: Performance should be very equal to the current side exhaust S-254 EVO and by design hopefully have a tad more! Viewed without cylinder, the transfer feed cut-aways and the cylinder's skirt clearance areas can be seen better. are the transfer feed and top and bottom for cylinder. case-half bolts pass through and need to be covered. * Also note the cylinder's hold-down bolts are darn near right on top of the case-half bolts' path. SHORTER cylinder securing bolts are fitted by RCMK for the RZ application. If updating to stainless steel fasteners you MUST be aware of this! The crankshaft is the same as all other RCMK engines. The piston however is RZ specific. (Though early R-254 pistons interchange). The wrist pin location is rotated 90 degrees as is the ring index pin. The skirt cut-away retains the same profile as before. The wrist pin bearing and thrust washers are the same as the "S" version. * RZ * R254 wrist pins have a teflon plug within the hollow portion so no air/fuel can pass through it. Cases view here show the beef again where RCMK has provided the secondary coil lugs but cast them into strengtheners behind the source coil area. Crank shaft bearings/seals along with a brass seal plate are the same as "S" version EVO engines reviewed before. * Note also as with all RCMK engines, provided are two sets of coil mounting holes for those wishing to change the timing specs. The stock position when viewed from the starter side is the lower set as shown in the first few pictures. I was not really talking about pipe heat, so much as the fact that you have to raise the pipe every time you want to go into the box. But that's something we live with already with most 100 and 105 degree setups anyway. I think the cleaner aerodynamics is really worth it. Pipe heat if from a side or rear exhaust engine is really no different. Most likely will be making a radio box cover out of G-10 laminate so it does not melt under the closeness of pipe / header. Looking good Scott! What are you thoughts on the pipe running over top the radio box? To me that seems like the only downside as opposed to a 90 deg header on side exhaust for a rigger. On a positive note though, it should reduce aerodynamic drag considerably. Keep us posted! rebar wrote: Good tips. And a well written review. Thanks Scott.